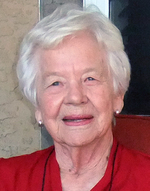 Mildred (Millie) Gladys McDonald was born on September 15, 1929, to Fred and Caroline Bessel in Melville, SK, and passed away, surrounded by her family, on Tuesday, March 20, 2018, in Saskatoon, SK, at the age of 88 years. On June 25, 1947, Mildred married Lloyd McDonald, and they moved briefly to Fort William (Thunder Bay), ON, where Lloyd worked for the CNR. They moved back to Melville in 1950. Their four children were all born and raised in Melville. Mildred was an avid homemaker, crafter and gardener. She loved entertaining and warmly welcomed family and friends into their home. She enjoyed bowling and watching sports, especially curling. She and Lloyd enjoyed a game of crib daily, and in her later years, card games were the highlight of her day. Mildred was a longtime and active member of Good Shepherd Lutheran Church, Melville. She and Lloyd moved to Saskatoon in 2008 to Luther Terrace to be closer to their daughter and family. Mildred was predeceased by Lloyd, her loving husband of 63 years, in 2010; her parents, Fred and Caroline; her sister Heddie; her brothers Clarence and Gordon; and her son-in-law, Bill, along with several members of her close extended family. She is survived by her children, Sandra (Kel) Hicke, Barbara (Archie) Deering, Marianne Hydomako and Lloyd (Shelly) McDonald; 9 grandchildren and 13 great-grandchildren.